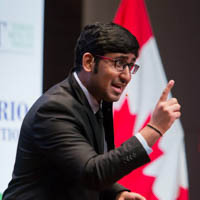 3MT® is a university-wide competition for graduate students in which participants present their research, creative activity, and its wider impact in 3 minutes or less to a panel of non-specialist judges. The challenge is to present complex research in an engaging, accessible and compelling way, using only one slide. 3MT® is not an exercise in trivializing or ‘dumbing-down’ research, but forces students to consolidate their ideas and discoveries to become transferable after graduation. 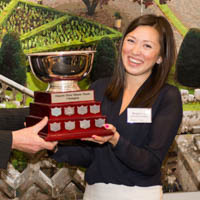 For the 2019 3MT® Competition, each college will hold a competition in order to decide upon two finalists who will advance to the University of Guelph 3MT® Final Competition on April 3rd. The public is invited to cheer on the contestants in both the college heats and the final competition. Tune in April 8-12 to Facebook  and Instagram  to vote for the 3MT Community Choice Winner. 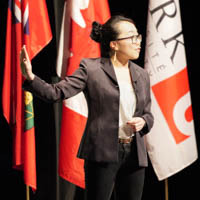 The winner of the University of Guelph 3MT® competition will move on to represent the University at the Provincial Competition hosted by McMaster University on Wednesday, April 17th, 2019. No additional electronic media are permitted (e.g. sound and video files).